[1st Day] Jesus’s Clay vs. Kiko’s Mud – Kiko twists a famous bible story in order to provide a principle of his catechumenate. [4th day] Unsalted, Unenlightened. We’re Judas! – The third circle, those who criticize the Way. The development of the NCW’s persecution complex. [4th day] Judas is saved! – A critical look at Kiko’s Doctrine of the Necessary Judas, and another esoteric teaching. [5th day] The Fifth Night – Kiko’s catechists have a cynical view of your experience of God that you’ll share with them during this session. [7th day] Judge Not? – Three problems with teaching about judging others. [12th day] Kiko’s Abraham: A Father and a Failure. 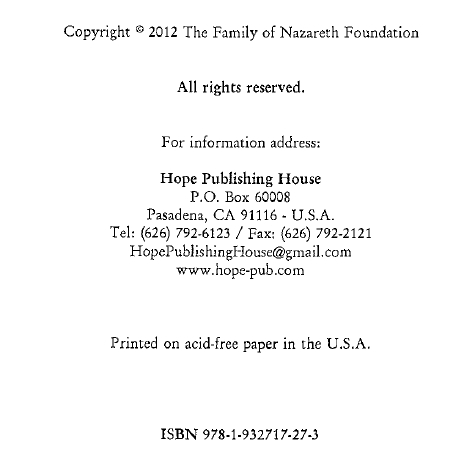 The Neocatechumenal Way begins it attempt to convince you that you are a failure and that your family is your idol. [14th day] Critiquing Kiko’s Kerygma – Why does Kiko’s kerygma seem to deliberately exclude the possibility of purgatory? [Final Convivence and 3rd day] Kiko’s Passover Problem, Part I – If Kiko is wrong about the celebration of the Passover in first century Palestine, how could he be right about the worship of the first century Christians? [Final Convivence] Kiko’s Passover Problem, Part II – Wherein Kiko’s teaching is found to contradict that of four Doctors of the Church. 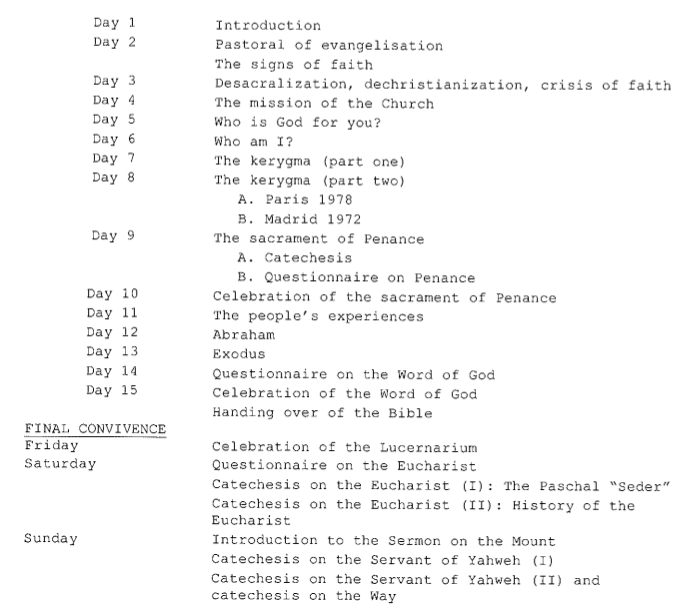 [Final Convivence] Taking a red pen to heresy – An example of a grave error that was removed from the original Catechetical Directory prior to its “approval”. 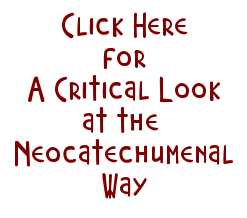 The Pope LOVES what the Neocatechumenal Way is providing regardless of a few so-called mistranslated exerts of the initial catechesis . Long live Kiko! No, Ralph, the quotations are verbatim from the original English…just pull out your copy to check. I’m a Catholic from Iraq, and I’m in the NCW since a year and a half, and I want to leave this way. When I first joined, I was very happy, but some time ago I began to discover things that I didn’t like (most of them on your blog and thanks to you) especially the things that happen in the scrutinies. 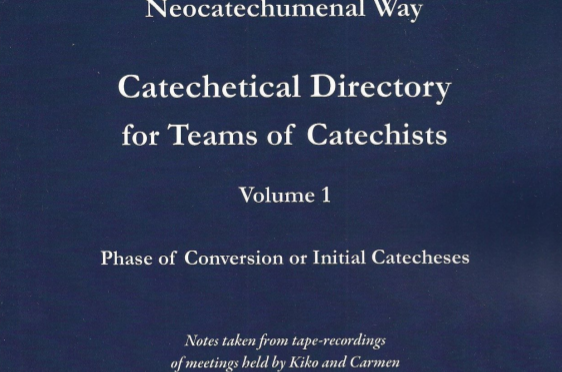 My question is: how can I get the catechetal directories ? because “my chatechests” suerly won’t give me a copy or lend me one.. Thanks a lot Chuck ! I’m sure these will be helpful (after getting them translated of course), and I assure you that I’ve left this cult forever. Another thing is, that I’m a bit afraid of starting to tell people about what this way really is, because I’ll face many problems… do you recommend anything ? In the first place, I pray often for our brothers and sisters who have suffered so much in Iraq. As for the so-called scrutinies, such a procedure has never been allowed in the Church. As far back as the fifth century Pope Leo the Great (440-461) forbade any such manifestations or questioning regarding the personal sins of members of the Church. These are matters for Confession, which has the guarantee of the sacramental seal. I hope you have already left that sect, and I pray that the Lord will give you much strength to bear witness to him in the difficult situation that exists in Iraq, although are present it seems to be improving.